This church is unusual as it is a late single period construction erected in 1874-5 by R. M. Phipson and dedicated to Reverend Charles Norman by his widow. 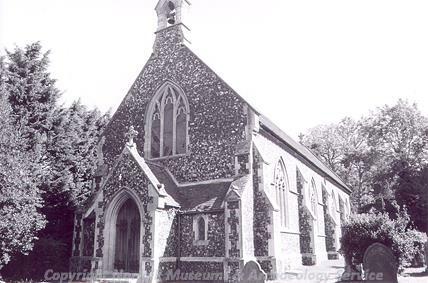 This pretty flint-built church has a combined nave and chancel and exposed bell mounting. The windows are Decorative style imitations and these along with other features suggest a lack of funds needed to meet the intended plans. Inside, the original pulpit and pews survive under the elaborate roof bracing. A set of carved Royal Arms is visible on the wall and the organ is a recent insertion (in 2000) from St James Harpur Hill in Buxton. The graveyard outside contains several unusual monuments, though these are mostly recent. Organ from St James Harpur Hill, Buxton, to be installed 2000. This church is built from random knapped flint, limestone and brick. It has a plain tile roof in two alternative shades, decorative ridge tiles, stone gables. The nave and chancel are combined and the west porch is flanked by recessed porticus. The windows imitate Decorated style. There is a west bellcote. Interior has elaborate 7 bay roof divided by arch braced trusses, intermediate scissor trusses. There is a carved screen round the north porticus. Original pews and pulpit. Carved royal arms are visible at the west end. Listed as grade II, see (S1). E. Rose (NLA) 25 September 2003. Re-ordering of interior along with accomodation of kitchen and w.c. proposed. See (S2) in file for further details. E. Rose (NLA) 6 October 2003. Full description in file (S3) of this remarkable building which has some evidence that the funds were not sufficient to achieve the original plan. Original furnishings. Graveyard with unusual, though recent, memorials. See photograph (S4) in file. E. Rose (NLA) 14 September 2004. --- Photograph: Photographs of Christ Church, Whittington, Northwold. Colour. <S2> Unpublished document: Logan, J.. 2003. Re-ordering proposal. <S3> Unpublished document: Rose, E.. 2004. Building Report..
<S4> Photograph: Rose, E.. 2005. KVN1.